Courtesy of Ventana Fine Properties. Built by D.D. Castleberry in 1962. This gem has been meticulously cared for by the current owner since 1992. 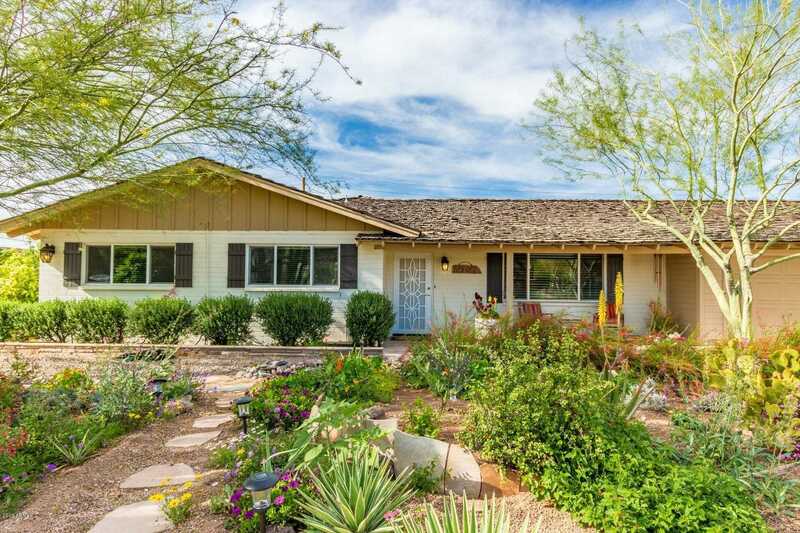 The 3,107 sq ft home is charming and inviting from the moment you arrive, with a mature, desert landscaped front yard, Arizona flagstone pathway and seating area to enjoy the neighborhood and views. This beauty has a north/south exposure and is surrounded by several mountains, Camelback to the north and Papago Buttes to the south. The entryway opens into a light, bright, formal living space, and the floorplan has grown with the love of the owners. Every window has optimum viewing of the gardens that surround the home. Directions: South on 60th St. from Thomas to Edgemont first right (West) to property on north side. Partial floor update in 2018. Partial wiring update in 2018. Partial plumbing update in 2018. Partial heating and cooling update in 2018. Partial roof update in 2018. Full kitchen update in 2018. Partial bathroom update in 2010. Full room addition update in 2018. Approximate size: 11019.00 sq. ft. Please, send me more information on this property: MLS# 5881964 – $787,500 – 5902 E Edgemont Avenue, Scottsdale, AZ 85257. I would like to schedule a private showing for this property: MLS# 5881964 – $787,500 – 5902 E Edgemont Avenue, Scottsdale, AZ 85257. This content last updated on April 25, 2019 10:48. Some properties which appear for sale on this web site may subsequently have sold or may no longer be available.